The Flash 3.16 “Into The Speed Force” review: Barry is blaming himself (rightfully so) for Wally being gone. And he probably lost Iris for a couple of episodes. 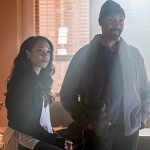 “I’m going back into the speed force.” Jesse wants to come, but HR doesn’t want to get a punch from Harry, and Barry needs her to protect the city. Joe (Jesse L. Martin) is worried, but HR comes up with exactly the right idea. He’s like Cisco’s muse. They will tether Barry and monitor his vitals while he’s in the speed force. Julian’s impressed. Cisco: “to Infinity and Beyond.” He’s the best. The best! 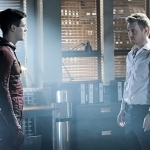 In the speed force, he is in the police station and there is Eddie (Rick Cosnett). I missed Eddie. He asks him why he’s there. Wally is in the prison his future self created. He creepily reenacts his own death. Eddie says he can have Wally if he can outrun the terrifying time wraith. Jesse asks Cisco to track Savitar so she can go after him. HR is eavesdropping. The Savitar piece may act like The Iron Giant pieces. HR says wait for the real Flash. There’s a you’re-not-my-dad moment. Joe gives one of his “dad” talks to Iris. Barry hears a baby. Caitlin is rocking a baby girl and Ronnie (Robbie Amell) shows up. Next up in Barry’s “this is your life” tour is Hunter Zolomon. Barry breaks his tether. Everyone else panics. He’s not allowed to trade places with Wally. 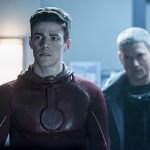 Leonard Snart (Wentworth Miller) shows up to let Barry know that Wally is reliving the most painful moment of his life “over and over and over.” Snart tells him that Barry was the one who inspired the real Snart to be a hero. Just as he is about to take out Barry, John Wesley Shipp‘s Flash saves him. It’s really him. 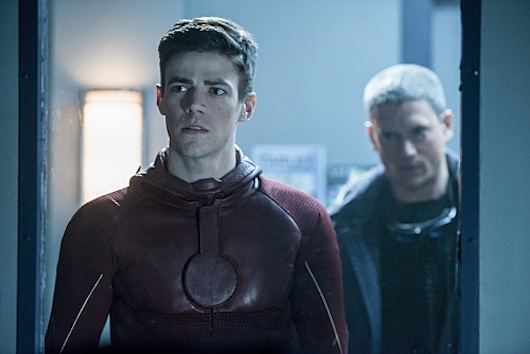 Snart tries to stop him, but Barry is able to thwart it. They get Wally, but Jay goes to stay in his place. Barry doesn’t want that, but Jay insists. SUCH a dad thing to do! They return to Earth-1. Jesse is going to go to Earth-3 to protect it while Jay is gone. More goodbyes. Barry tells Iris they need some space. I think that this is a mistake, but I get it. I think the speed force episodes are my favorite – similar to dream sequences, alt-Earths, etc. It is just so much fun to see old, familiar faces, where crazier (than usual) things can happen. 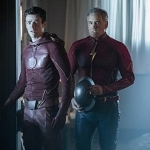 This episode taught Wally, Jess, and Barry valuable lessons – lessons that Jay has already learned so he was free to make the sacrifice. Next week is the crossover Supergirl/The Flash musical episode! BARRY TURNS TO THE SPEED FORCE — Desperate to stop Savitar and save his friends, Barry (Grant Gustin) turns to the speed force for answers. H.R. (Tom Cavanagh) gives Jesse (guest star Violett Beane) some advice. Gregory Smith directed the episode written by Brooke Roberts & Judalina Neira (#316). Original airdate 3/14/2017.